As the amount of content that is being produced on networks like Twitter is increasingly becoming harder to filter, due to the tremendous amounts of such data, the advent of tagging keywords with # hash tags and $ cash tags have provided a viable means of collating related tag-specific content. Since Twitter’s Initial Public Offering (IPO) and successful launch as a publicly traded company, Forex Magnates recently covered several such services which each appears to have unique approaches to curating Twitter for Foreign Exchange and other finance, including the one we will discuss today. Scutify is a website dedicated to applying such methods in the Twitter network, and specifically for asset classes like stocks, commodities and Forex (including the recent addition of Bitcoin to the FX category). The company validates users based on their Klout score if available, location, and filtered keywords that have been tagged in tweets which are then visible on the Scutify website. Through the web interface, users post Scuttles which together with the curated tweets, meet the filtered hash tags and cash tags criteria of tracked asset classes (adding to the collective related discussions) or are shared as posts within the network. 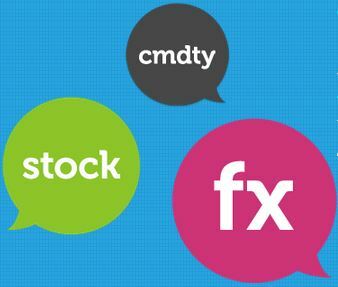 The use of cash and hash tags in social media have become popular on sites like StockTwits and Twitter, and then on Facebook, and as a means to track underlying asset classes, currency pairs and symbols or other financial market securities posted to social media. According to Forex Magnates’ research, while this is a valid means of tracking trading-related news that affects markets, often the results contain large amounts of discussion and chatter about assets rather than actual breaking news that originates from sources that effect underlying assets (e.g. discussion about economic data versus the actual economic data being released from the governmental agency at the time of announcement). Nonetheless, chatter and trader discussion can be important too, especially as a gauge of market consensus. A look at the Scutify dashboard in the Forex section reveals some major and cross currency pairs, Bitcoin, and a list of “other FX pairs” that can be selected from a drop-down menu. A delayed price chart and list of related Tweets appear beneath these as can be seen in the example screenshot below of a segment of the Scutify web interface. Another important aspect of the design of Scutify is that it can comply with company IT policies with regards to access to posting to Twitter, since much of the data posted is available in a read-only format (in addition to having the option to auto-share back on Twitter) and even available without logging into the website. This offers users the ability to read content from the homepage and using available tools, or to login for more features and capabilities. In reviewing the Scutify website in detail, according to the terms and conditions, certain market data and prices are delayed for at least 10 or more minutes, therefore the service may be more useful as a look-back to the current market sentiment as opposed to real-time rate changes or breaking news. From a trader’s perspective this could be useful since over a 10-15 minute time frame the consensus of a trader’s collective perception as echoed through mediums like twitter can become more evident, and therefore provide users of Scutify the ability to perceive this information based on their own subjective interpretation of it in retrospect. 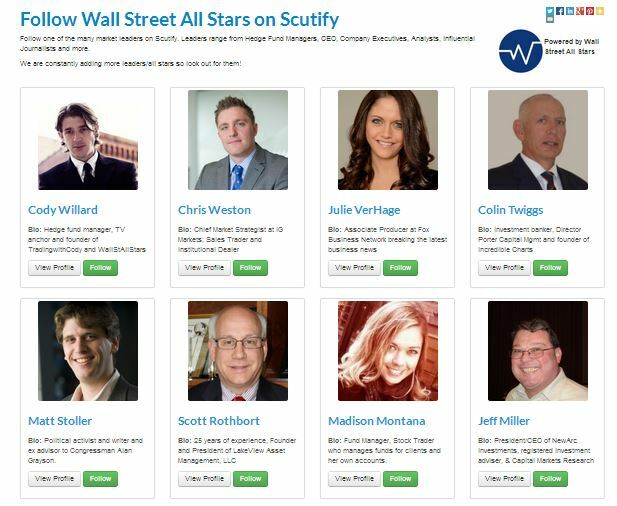 In addition to curated Tweets and Scuttles on the Scutify network, users can also choose to follow people from a list of “Wall Street All Stars” who are users that fit the role of industry professionals and have joined the list (which appears to be growing). The difference between Scuttles and Tweets is that the former originates on the Scutify network, whereas the latter is filtered from Twitter. While both can have value for users of Scutify (or as the company calls their users “Scutifiers”), for the purposes of sharing or cross-posting the same content between both networks, the company offers users the ability to have their Scuttles automatically posted to Twitter through a feature that will automatically publish out to connected Twitter accounts every 30 minutes, eliminating the need to have to post to both platforms. 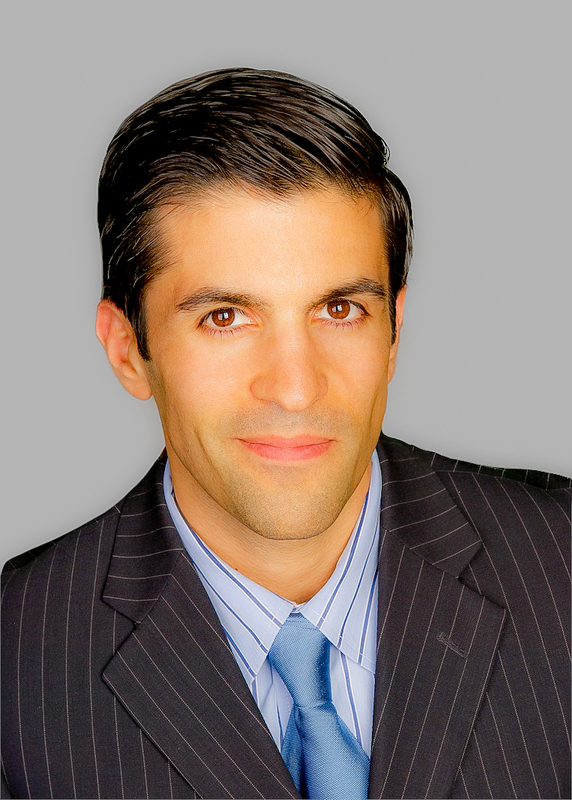 On the Scutify homepage there is also a section with editorial content from the firm’s co-CEO Cody Willard, who operates Wall Street All Stars and the’ Trading with Cody’ blog, as well as the Revolution Network, and has a distinguished career with news agencies and as a TV anchor and media personality on financial markets, including previous roles as a former hedge fund manager. Mr. Willard serves as Chairman of Wall Street All-Stars which is the parent company of Scutify, as explained to Forex Magnates by Mr. Ly. Just 16 hours ago, Mr. Willard posted a scuttle regarding how the 30,000 download mark will be surpassed this week for the Scutify app, from the Google Play Market for Android and iTunes Market for iPhone. In comparison to the Twitterwires’ services launched by Infront earlier this month, and the unique approach by FSwire using a library of key-words that relate to asset classes and combining computationally intensive queries, services such as Scutify and the above mentioned providers appear to be gaining traction as something needed by traders and industry to make sense of Twitter for Finance. 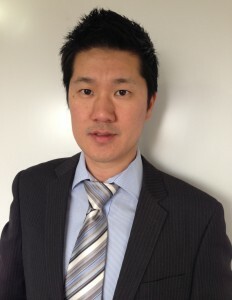 According to Scutify’s founder, considerations of an enterprise solution have begun, in order to offer the Scutify service to brokerage firms and to help power trading platforms with curated twitter feeds, although at the moment it is available as a stand-alone service, as told to Forex Magnates during our exclusive interview. I have been using Scutify for a while now and it’s now become my #1 finance app. Sure it doesn’t have the best Watchlist or charts etc but it brings a new dimension to the table with social chatter and the ability to follow real industry professionals who ply their trade on the markets each day. Commentary from Cody Willard, Richard Gobel and Jeff Miller on a daily basis has been informative, unbiased and helpful. Great job Kheang and the team at Scutify.